This 1999 production blank ammunition is some of the finest blanks ever produced and used around the world by militaries and the Movie & Television industry. If you are looking for quality blanks at a great price these are it! Note: This item ships via UPS Ground Service only, not available for air shipment or shipping via US Postal Service. Note: For use in a semi automatic rifle your rifle may require a Blank Firing Device. May not cycle all semi automatic rifles. Note: This product does not apply for any shipping promotions. Note: This item is not able to be shipped to California or New York unless purchased by a FFL Dealer. Note: This item is not able to be shipped to Massachusetts, Washington DC or the City Of Chicago. 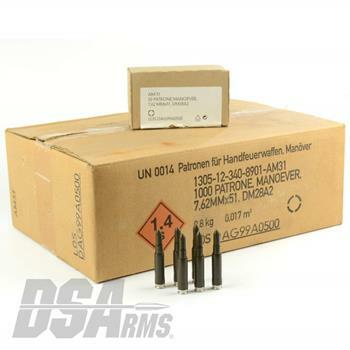 By purchasing this ammunition you are agreeing to DS Arms Ammunition Purchasing Terms & Conditions as described on our Terms & Conditions page. Click HERE to view our "Ammo Purchasing" Terms & Conditions.